I picked up these shoes at Walmart four years ago when I was visiting my family for Christmas. I didn’t really need them, but they were on sale for $5. I can’t believe how well they’ve held up over the years. I wear them all the time in the summer, and I’ve never even had to re-heel them. Today was a very productive non-employed day, courtesy of the New York Public Library system. 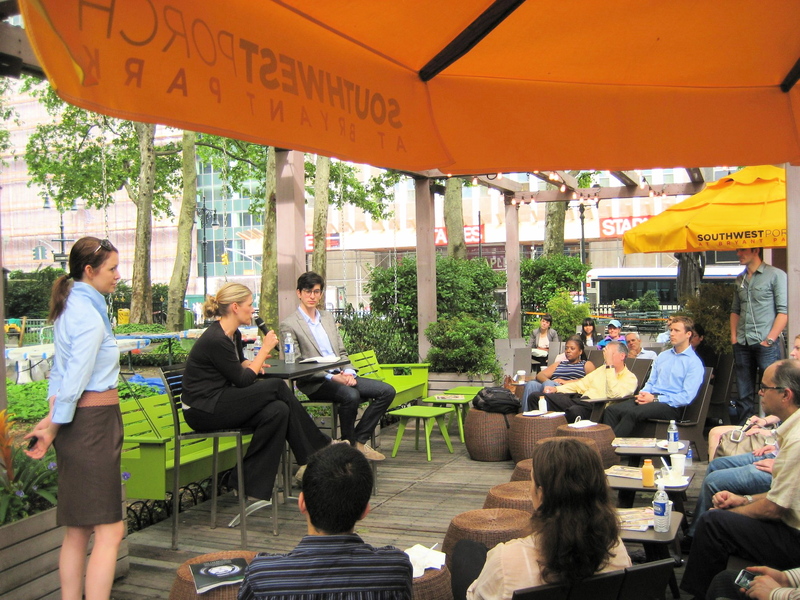 I went to the inaugural Breakfast Briefing at Bryant Park (the park attached to the flagship New York Public Library). David Zax, media business and technology writer for Fast Company interviewed Alison Moore, the Senior Vice President of Digital Platforms at HBO about the company’s digital offerings and practices. They had an AMAZING breakfast spread, with a Greek yogurt bar, fresh fruit, warm bagels with cream cheese and jam options, OJ, tea, and coffee. Both the speakers were very engaging, and I was impressed at the way HBO strives to keep their users’ content experience consistent across multiple platforms. Free food and magazines! What better way to start the day off? Afterward, I went to an outdoor yoga class. This was also in Bryant Park. I studied for my French exam in the library for a few hours, and then checked out the Celebrating 100 Years exhibit. I finished up the evening at the Science, Industry & Business Library for an employment seminar about refocusing the job search. Totally inspiring. I had a very entertaining, full day, and it didn’t cost a dime. Who says New York is unaffordable? Not me! This entry was posted in 21 Day Shoe Challenge, Art, Free NYC and tagged 21 day shoe challenge, breakfast briefings, bryant park, fast company, french, hbo, SIBL, yoga. Bookmark the permalink.